As promised, the adorable Nendoroid Miyako from Hidamari Sketch x Honeycomb is finally available for pre-order starting today. Yunocchi’s close friend, with a fun and cheerful personality! 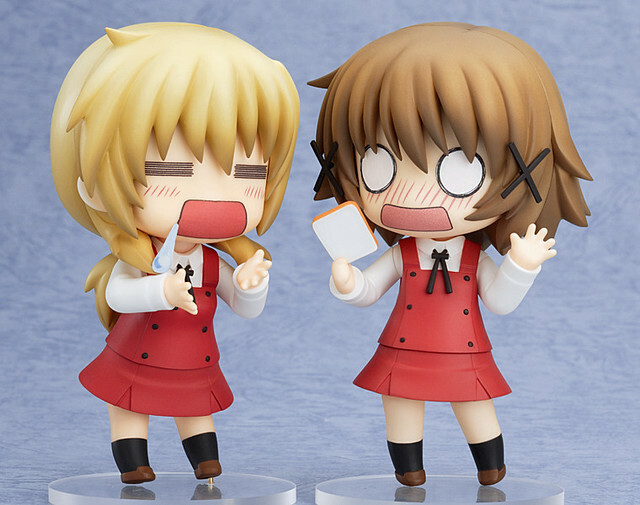 From the anime series ‘Hidamari Sketch x Honeycomb’ comes a Nendoroid of Yuno’s close friend, Miyako! She comes with a number of optional parts that show her love for food, such as a giant serving of rice with chopsticks as well as a hanging scroll with the kanji for ‘tuna’ written on it. She also comes with cross-legged parts and a floor cushion to sit on. Three different expressions are also included – her standard expression, a smiling expression and a blank expression with stickers, allowing you to create your very own expression! Be sure to display her together with Yuno, and enjoy the energetic antics of Miyako whenever you like! She will be priced at 3500 Yen and should be released to the stores on June. This entry was posted in News and tagged hidamari sketch x honeycomb, miyako, nendoroid.